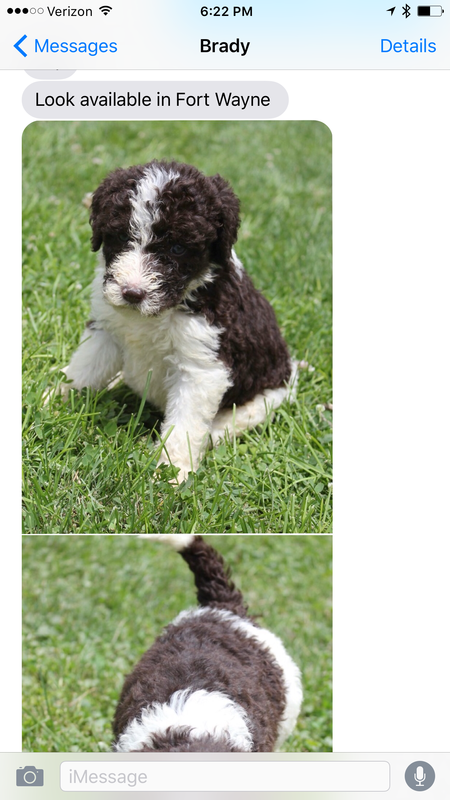 We already have a beautiful black labradoodle named Coco. She is trained, smart, and doesn’t chew on my furniture. She is five years old and doesn’t run away when I open the front door. And, of course, my husband would wait until I’m on my way to speak at a conference in Iowa. But, that part of all of us that can’t resist the power of puppies made me put down my burger and begin texting him back – I mean it was as if my fingers were speaking for my heart and totally ignoring my brain! I said he was cute and I was “open” to it. That was all he (and my daughter Kayden) needed. They were off to the races. 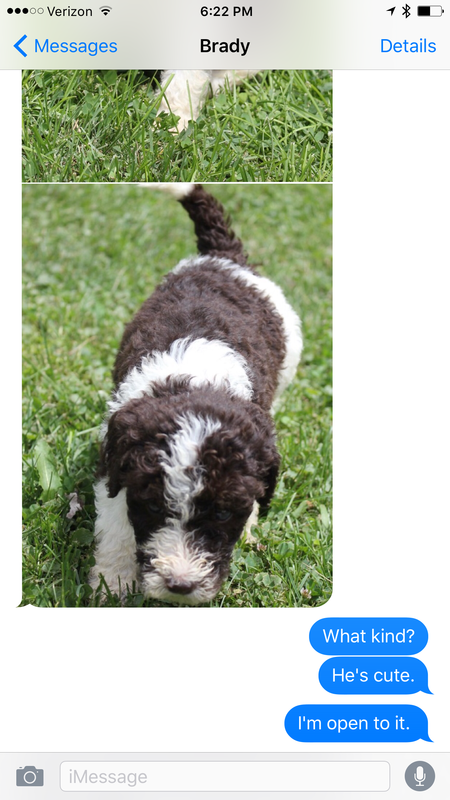 They began searching Fort Wayne for labradoodles to join our family. Brody was a rescue. A sad story, really. He was originally a stud dog for a breeder – but they found another dog they liked better. 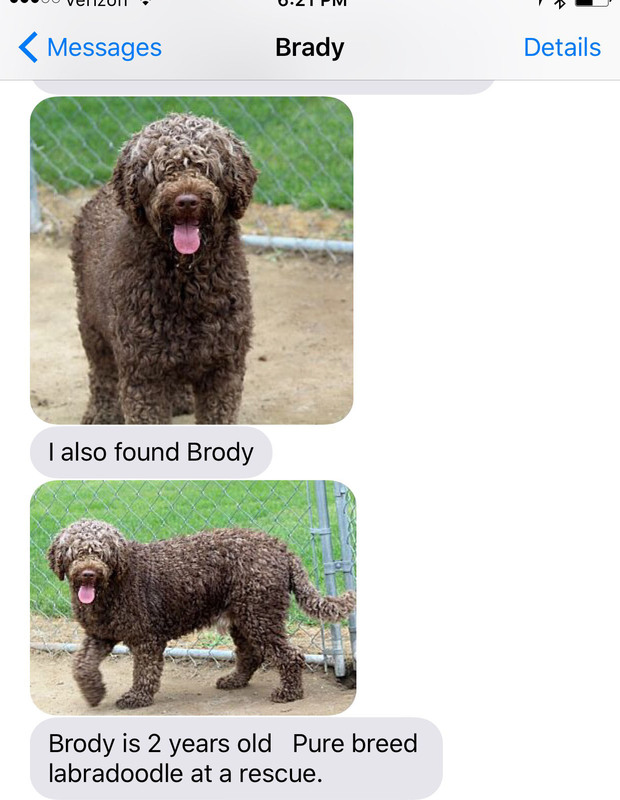 So poor Brody had lived in a 6 by 8 foot pen for two years. No love, no attention, just hanging out by himself in his little run. We (even me) decided we needed to bring him home. We promptly renamed him Fozzie (because he looks almost identical to the Muppet bear) and began loving on him. When I arrived home from my trip (which was amazing, by the way! ), I almost cried at what I saw. Fozzie shrank at every noise, every car horn, every pin drop. He didn’t know how to walk through doorways. He didn’t play with toys. He wouldn’t eat any treats. If anyone walked out of the room and back in he would run and hide. Fozzie hadn’t had much human connection and he was afraid of us. He had lived in his pen – alone, and he didn’t know how to operate in our world. The woman at the rescue gave us some really great advice. So we did just that. We continually told him, “You can do it.” And we helped him face his fears. He slowly began to trust us. When I took him to the vet, he pressed his body against my leg and hid under my chair, always touching my foot. When Brady took him for walks, he would walk so closely to him, his fur would rub against Brady’s pant leg as they walked. When Kayden would watch TV, Fozzie would lay closely beside her. We were helping him face his fears and he began, slowly, to trust us. We have a long road ahead of us (I didn’t include pictures of the half-eaten legos or the entirely demolished television remote control). But one day, as I was walking Fozzie, I thought to myself – isn’t this just like God? I mean, I am scared to death to walk through that door. To trust the process. To jump off that cliff. To obey what I know He’s asking me to do. But Jesus is always beside me saying, “You can do it.” He doesn’t feel sorry for me and leads me confidently into my fear. But He never leaves my side. It’s sad that anyone would treat Fozzie the way they did. It’s downright wrong. 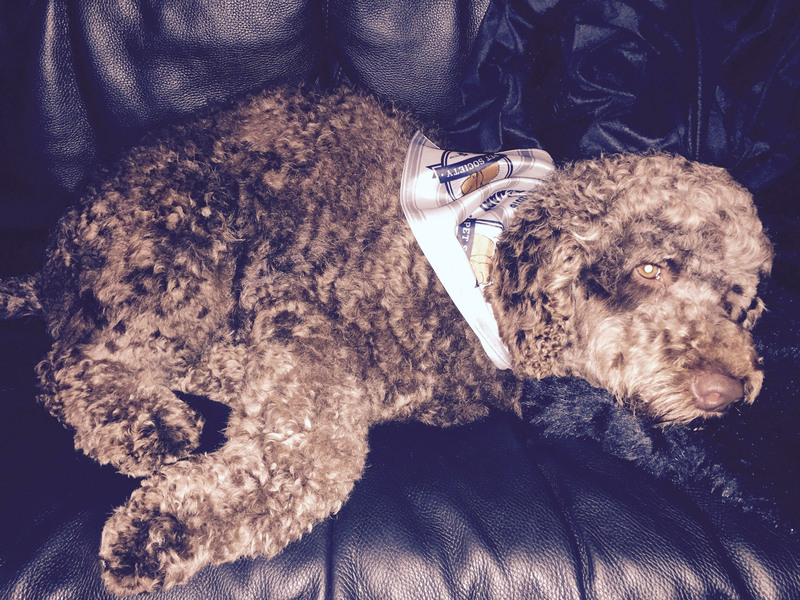 But Fozzie has seen our consistency and, over the weeks, our historical patterns of leading him into safe spaces. But even when we lead him past the dangerous intersections or past houses with barking dogs, he understands that we know best – because we’ve never hurt him before. Occasionally, he is startled or shrinks back, but we tell him “You can do it” and gently push him to keep walking. So he presses more closely to us. He leans in. He hides in our strength and lets us lead him. We’ve all been hurt. We’ve experienced sickness and pain and death and loss. And it isn’t fair. It isn’t right. But Jesus has always been consistent. Historically, He leads us to safe spaces. And even when there is danger, He never leaves us – and we trust Him, because He will never forsake us. Just like the Fozz-ster, we can press in closely. Spend time with Jesus. Lean in. We can hide in His strength and realize we can’t do anything on our own. We can let Him lead us. My husband says he’s a simple man so he likes simple analogies. Me, too. And I’m thankful that a sweet, rescue dog can remind me that I have a God who loves me enough to tell me, “You can do it” and walk me through that next doorway. Not a great picture, but a very happy dog. Carrie is a teacher, writer, speaker and joy chooser living the best day ever adventure. Learn more about her here. Her most recent post for high school students is here. Learn about her adoption, her father’s cancer journey, or her journey with food. Thanks for visiting my website! Please subscribe for bi-weekly (or kind of bi-weekly) updates! Posted in Best Day Ever Adventure, Inspiration and tagged anxiety, fear, pet adoption, rescue dog, worry. Bookmark the permalink. Absolutely He does. Thanks for stopping by, Andrea! Amazing story! Fozzie is a brave one. So sweet – what a sweet dog! And I love your thoughts…. thank goodness Jesus is always by our side! Thanks, Clare! I couldn’t do anything without Him! my son and daughter in love rescued a dog and the transition was met with love and now she is just right at home. love this! aww what a precious post! Your rescue dog is adorable!